Do you wish you had new kitchen cabinets? Are you worried about the high cost of cabinet replacement? At Cabinet Magic, we can work with your budget to create a brand new look for your kitchen. How? The answer is custom cabinet refacing in Diamond Bar CA. What Is Cabinet Refacing in Diamond Bar CA? 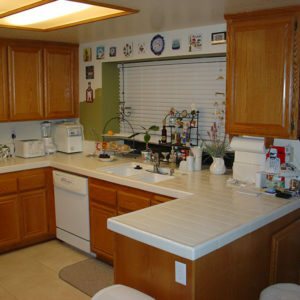 Cabinet refacing in Diamond Bar CA is a type of remodeling that focuses on the visible parts of your cabinets. This obviously includes your cabinet doors and cabinet drawer fronts, as well as any crown molding you may have. Any other exposed cabinet surfaces, such as the outsides of corner or end cabinets, will also be updated. We typically cover these surfaces with a matching material so they look just like your new doors and drawer fronts. Your new cabinet doors and drawer fronts will be custom made just for you, to suit whatever design constraints you may have. You can have your choice of styles as well as just about any color of paint or wood finish. Cabinet refacing in Diamond Bar CA is also an excellent opportunity to update your cabinets to include new features like soft-close door hinges, shelf pull-outs, and built in spice racks to name a few. It’s Cost-Effective: Cabinet refacing gives you more for your money, because you get the same dramatic design improvement without the high labor and materials costs of all new cabinets. It’s Convenient: There’s no need to turn your kitchen into a construction zone when you get cabinet refacing. There will be very little demo work and the new cabinet doors and drawers can be installed in just one visit. If you’re ready to transform your kitchen with cabinet refacing in Diamond Bar CA, Cabinet Magic is here to help. Our top-quality craftsmanship, combined with a dedication to customer service, allows us to consistently meet and exceed client expectations. For a free in home estimate on cabinet refacing, please contact us at 800-828-4380 . We’ll be happy to schedule a visit from one of our design specialists.